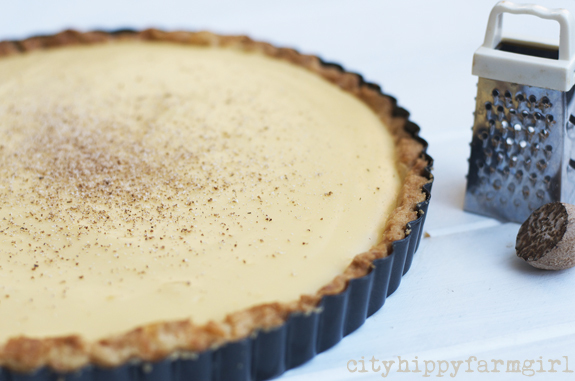 This entry was posted in Food Glorious Food, Rambles, Waffles and Digressions and tagged chocolate pudding, custard tart, desserts, easy, old fashioned, pastry, recipe, self saucing, simple by cityhippyfarmgirl. Bookmark the permalink. Wow this tart looks beautiful and delicious! I never particularly liked finger buns, but custard tarts, yes….even the dodgy ones are still pretty good. No you should definitely not stop making it then Jane! I’d had a custard tart on my mind for quite a while as well. It’s funny how things go in but don’t go out unless you make them. Love it. Thats what Im making today. A forgotten favourite. Julie, I’m not sure I’d ever had a home made one either until you mentioned it. 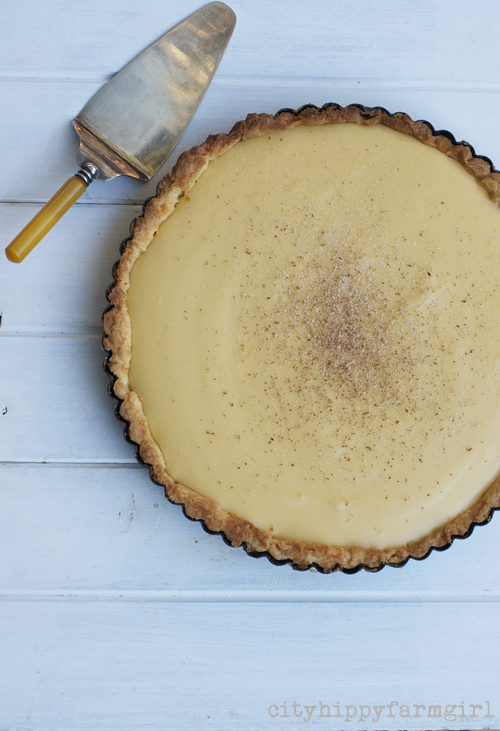 My mum used to make a coconut custard pie, but it was quite a bit different to this one….will have a little think on how I could change it with out the eggs too. This looks so yummy & your pie crust looks perfect! I haven’t actually eaten many custard tarts before, probably only had it 4-5 times in my life! A favourite dessert growing up was a self-saucing butterscotch pudding, which we still make, as it is yummy! Thanks so sharing this delicious sounding recipe! Really Sarah? Only 4-5?…Never I probably ate your share over my life time, and *ahem* half of my suburbs. Butterscotch pudding however, maybe I’ve only had once or twice…might need a revisit I think. Oh sad face. It’s ok, I’ll keep the flag flying for the old self saucing chocolate pudding. In fact I made one last week. I love how the sauce gets thick and sinks, it’s like a chocolate magma. I know some that don’t like the combo of hot and cold, but warm desserts with icecream … so. delicious. Your custard tart undeniably looks tasty, but I question it’s capacity to warm my soul on cold winters night. Sounds like a good excuse to try it out! “Soul Warmers”- now that could be a winter dessert cook book couldn’t it. Surely. How about a golden syrup pudding with vanilla icecream on top? Hot and cold…can we compromise with that one? Ha. that is a cracker name, LOVE IT. SO funny you mention the golden syrup pudding. Best camping dessert (apart from Bookernoe nuts, remind me to run you through those, they are spectacular) is what i call ‘mummy’s boy dumplings’. Basically little individual golden syrup dumplings. generally no ice cream but definitely a soul warmer round the campfire. Your photos are just stunning Brydie. I do love an old school chocolate self saucing pudding, they take me straight back to my childhood! In recent times I have modified the basic recipe to a plain/vanilla pudding and added lemon or lime juice instead of the water to make a citrus sauce. It maybe out of control but think of the amazing foodie memories you’re creating for your kids Jane. They’ll thank you in years to come. As for a lemony lime flavoured pudding- yes! Lemon Delicious…ohh I’d forgotten about that one. My baking list continues as well it seems. Thanks Johanna. Yes puddings, especially chocolate ones are a bit tricky to photograph aren’t they. It does something a little extra doesn’t it. For some reason I love grating nutmeg with my little tiny grater. It’s very satisfying! I love how these ingredients are kitchen staples so you can whip up a nice dessert on the weekend. Also I can use lactose free milk for my lactose free kids. Pre-kids I use to pop down to Petersham for those little award winning Portuguese tarts, a shot of coffee and a styvo. Portugese Tarts are pretty amazing aren’t they. There has been a request to make some for a birthday coming up…I’m rather happy to oblige. Sigh. How stunningly beautiful it looks but I cannot make pastry — of any sort. You can Rose. You can! I’m not a fluffy baker. I cut corners and hack bake every day, pastry is doable. Promise. Oh stop it…..! That just looks divine! That’s rather a good thing I say Kari. Wonder what will be on you dessert plate in another decade or two. Yep, custard tart does it for me, but then so does a good chocolate self-saucing pudding. Couldn’t I have a bit of both? Choclette, you know another recipe I used to do “back in the day” was a chocolate custard pie….it could be done. I hope Stevie-boy likes it lovely! I made some Portuguese Custard Tarts for my Mum’s birthday dinner dessert on Saturday that they were divine. Oh yum BM. I’ve got them on my list too as a birthday request. It’s funny how palette’s change in adulthood. I remember hating olives, blue cheese and custard and now I love all three! This tart looks delicious, and your photos are beautiful. I’m always amazed how palates change too. I waited 20 years to like olives…it was worth the wait. Kalimatas are so very delicious. Hiya – I too was a chocolate pudding gal, and when I moved out of home was equally happy to have it as left-overs for breakfast as well!. I did have a period where I longed for the dishes that I produced in my parent’s home and after, and finally bought one of the old ‘cookery the australian way’ cookbooks that held these precious recipes. Only to find, like you, my palate has moved on. but I’m glad I did revisit and find that out. Now I have no more longing for dishes long past. I’m happy to experiment and follow my palate wherever it wishes to go. Thanks for this lovely blog – it resonated with me. I too am still a custard addict! 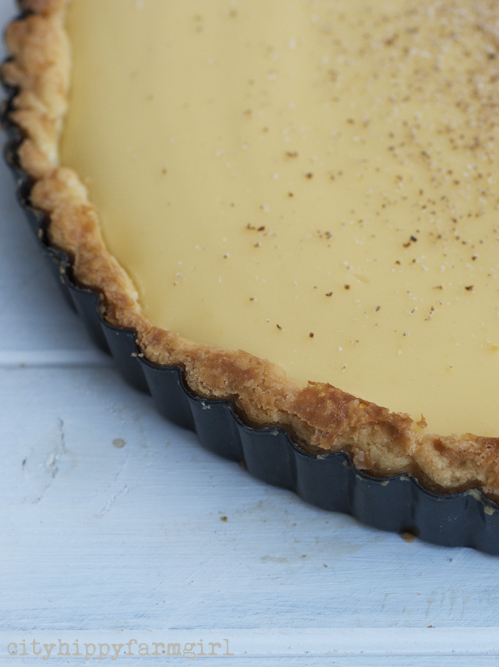 Custard and curd tarts are both family favourites. We are not a great pudding family, but these two always disappear! OH wow – this look so delicious! I’ll pin it for future reference. My husband loves custard and I’m sure he’d be over the moon if I made it for him.